The Theatre Project presents its production of ‘Mamma Mia!’ April 12 – 14 at the Mable House Barnes Amphitheatre. The music of ABBA’s hit songs tell the hilarious story of a young woman’s search for her birth father. This sunny and funny tale unfolds on a Greek island paradise. On the eve of her wedding, a daughter’s quest to discover the identity of her father brings three men from her mother’s past back to the island they last visited 20 years ago. Above, The Dynamos singers include, from left, Sophie Faust, Kaylan Royston, and Gracie Price. Tickets can be purchased at the box office or online at ticketmaster.com. General admission tickets are $10 and children 12 and under are free. 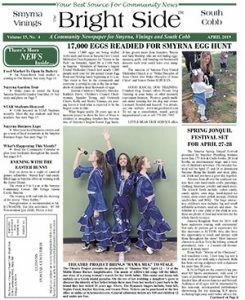 From the April 2019 issue of The Bright Side, Cobb County Georgia’s Newspaper covering Smyrna, Vinings, Mableton, Powder Springs and Austell, GA.
For more than two decades Darlene Duke has been helping feed, clothe and educate people in south Cobb and Douglas Counties. She stepped down as executive director of Sweetwater Mission at the end of the year but will continue part-time as business director. Brian Hamilton took over as executive director this year. He is retired as General Manager of Georgia Operations from Thompson Tractor, the Caterpillar Dealer in Alabama, where he worked 34 years. “Darlene has set a high standard of Excellence that I am committed to continue,” he said. Sweetwater Mission, located at 6130 Hotel St., Austell, began in 1968 as members of several churches came together with a plan to help low-income families in their community. Volunteers formed a small used clothing distribution center and soon began to offer food and financial aid to neighbors in need. Community Action Mission Program or CAMP was formed – later known as Sweetwater Valley CAMP and now simply Sweetwater Mission. Mrs. Duke began her career at the charity in 1994 as a volunteer though her church. The first Director, Ruth Reed, later asked her to join the board of directors. As it grew, the board sought to hire two part-time employees and Mrs. Dukes suggested they combine the jobs to make it full time. She went to work full time in 2003 and became director in 2005. Sweetwater Mission now serves some 1,500 clients per month with some 200 volunteers and four full-time and four part-time staff. Some 75 clients a day visit Monday through Saturday for donations of food, clothing and educational programs. “We had some record breaking days right before Thanksgiving with 105 to 108 people back to back.” She said. The agency may be small, but has gotten noticed by United Way of Metro Atlanta which placed a pilot program, Kid’s Home Initiative, to deal with homeless students at Sweetwater. Sweetwater does not government money. That allows them to assist undocumented clients. “If the federal government will pay to send them to school, don’t tell me that I can’t pay to feed them,” she said. The food program relies on cash donations from business, churches and individuals to stock a food pantry with items from the Atlanta Food Bank. While they have a good selection of women’s clothing, there is a need for men’s clothing and clothing for school-aged children. On her two days off from work Mrs. Duke will stay busy with her volunteer work. She is Vice-President of Georgia Church Women United and wants to get more involved in United Methodist Women’s group at her church, Powder Springs United Methodist. She is active in the South Cobb Rotary, serving as past-president and treasurer. She chair as backpack program and is on the board of the Douglas County homeless coalition. What is she most proud of in her term with Sweetwater? “We have two people on our staff who formerly received assistance from us,” she said and it’s wonderful to have them feel good about the experience. Keep Smyrna Beautiful was honored with a 2nd Place award for its overall programs in 2018. 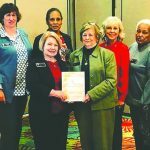 The award was presented by the Keep Georgia Beautiful Foundation on Dec. 6, and marks the 23rd consecutive year the local non-profit has been recognized for excellence in environmental efforts. Keep Smyrna Beautiful’s programs touch on water quality, solid waste and recycling issues, trees, beautification, community sustainability (the community garden and outdoor market), mobility (bike racks), and community involvement (Adopt-A-Mile and other volunteer programs). “Today, Americans are moving faster and doing more with the modern conveniences our society provides. But this comes at an expense to our natural resources, beauty and community cohesion we work every day to improve. “Our national challenges with litter, recycling and beautifying communities will be even more relevant in the years to come as they were in 1953 when national nonprofit Keep America Beautiful was founded … more than in 1967 when canine TV star Lassie appeared as a mascot for our anti-littering public service campaign … and more than 1999, when we launched the Great American Cleanup. As Keep America Beautiful is more than anti-litter, so is Keep Smyrna Beautiful. “We are the official organization for all things environmental in the City of Smyrna. We have begun to work on projects such as Atlanta Regional Commission Green Cities Designation, EV Charging Stations, a Tree Save program. We are moving forward every day to help the City of Smyrna be the best it can be”, said Janet Liberman, Executive Director. Volunteer, philanthropist and community leader are among the many titles that Barbara Hickey has accumulated in the past two decades. In November she was named South Cobb Citizen of the Year by the Cobb Chamber of Commerce, the South Cobb Business Association and the South Cobb Rotary Club. Albert McRae, president of the South Cobb Rotary Club, said Mrs. Hickey was always elegant and well spoken. “She’s a doer, a person of action. Barbara Hickey represents service over self,” he said. Hickey, who is suffering from health problems, was not at the meeting. Her son and daughter-in-law Sean and Cecilia Rowe accepted the award in her place. Sean Rowe said his mother loves Cobb County and its people, refusing to leave even when her husband Jim Hickey was offered a prestigious job elsewhere. The Cobb County Center for Excellence in the Performing Arts at Pebblebrook High School will present “Legally Blonde: The Musical” Jan. 31 through Feb. 3 at the Anderson Theatre, Cobb Civic Center, 548 S. Marietta Parkway, Marietta. Based on the hit movie, Legally Blonde: The Musical follows Elle Woods as she traverses the halls of Harvard. After her break up with boyfriend Warner, Elle sets out to win him back by attending Harvard Law School. While there, she experiences the ups and downs of student life but sets out to prove herself to the world. This fabulous and action-packed musical will delight and enthrall with its memorable songs, charming characters, and scandal. Performances are at 8 p.m. Jan. 31, Feb.1, Feb. 2, and a matinee at 3 p.m. on Feb. 3. Tickets are available at www.andersontheatre.org/encore-series. Her resume includes jobs as teacher, principal and school board member. Now Susan Thayer can add the distinction of being Smyrna Citizen of the Year. 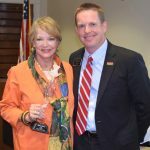 Mrs. Thayer was presented the award at the October Smyrna Division breakfast of the Cobb Chamber of Commerce. During her 40 year career in education, she worked for three metro Atlanta school systems, serving as a teacher, a guidance counselor at Osborne High School and the principal of Pebblebrook High. She also served as the director of leadership development and the executive director of high schools for Cobb County Schools as well as the assistant superintendent of K-12 curriculum in neighboring Douglas County. Thayer, the only woman on Cobb’s seven-member school board, did not seek re-election this year. She will be replaced by pediatric dentist Jaha Howard in January. Cobb Superintendent Chris Ragsdale said Thayer’s presence on the school board will be missed come January. Thayer said she hopes to spend more time with her family next year, and looks forward to seeing how the “other half” lives. She was nominated for Citizen of the Year by Smyrna Mayor Max Bacon, who said he couldn’t think of anyone more deserving of the award. Bacon’s sentiments were echoed by Smyrna councilman Derek Norton, who presented Thayer’s award. “She’s a longtime friend and has been very, very good for us on the school board,” he said. Thayer, who said she never expected to receive such a recognition, was lured to Brawner Hall early Wednesday under false pretenses by her friend, Cobb Superior Court Judge Ann Harris. Thayer said she was told the 7:30 a.m. event was a presentation about the new Susan Todd Pearson Middle School, which the district is building to relieve overcrowded Campbell and Griffin in her portion of the county. “She was certainly surprised,” Norton said. 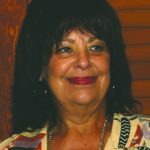 Thayer said serving on the school board would be her last professional activity, calling it a “tremendous honor” to step down with the accolade. 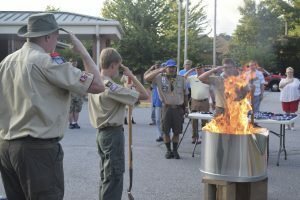 Boy Scout Troop 250 held a Flag Retirement Ceremony on Flag Day, June 14, at American Legion Post 160, the Troop’s chartering organization. Flag Day, June 14, is recommended as the most appropriate day on which to annually hold this ceremony. The ceremony was a joint and coordinated effort between the Scouts and the Legionnaires. Troop 250 was tasked over a year ago to collect the unserviceable flags presented to Post 160 at its flag drop box. Any person may drop off a flag suggested as unserviceable and it will be included in future ceremonies. Members of the Troop prepare flags at meetings when time permits and for this ceremony, 51 flags were retired. Additional flags may be retired in coming months and on Flag Day in 2019. Post Commander Wade Lnenicka opened the program and the Post Chaplain offered prayer. The American Legion’s Ceremony for Disposal of Unserviceable Flags is a dignified tribute to the U.S. flag and to its symbolism. The ceremony followed rules of civilian flag courtesy popularly known as the Flag Code developed in 1923. The Scouts solemnly presented three flags at a time, each folded in the traditional triangle and for each all present were at attention, saluting the flag until presented into the fire. This was repeated with all at attention until the last flags were presented and completely consumed. The ashes were collected and will be buried on Post 160 property in a proper final resting ceremony. While any one person or group may properly dispose of unserviceable flags, the cooperation between the American Legion Post 160, the American Legion Auxiliary Unit 160, Sons of the American Legion Squadron 160, Boy Scout Troop 250, Venture Crew 11, and Girl Scout Troop 1872, along with members of Smyrna’s Fire Station 1, demonstrated the community commitment to honor the flag, public service and show how multiple groups can work together. He said the ceremony is also a way of letting Smyrna residents know that if they have old, unserviceable flags to be disposed of, to bring them to Post 160. Flag Day commemorates the adoption of the flag of the United States on June 14, 1777, by resolution of the Second Continental Congress. The anniversary of the Flag Resolution of 1777 was officially established by the Proclamation by President Woodrow Wilson on May 30, 1916, and on August 3, 1949 President Truman signed an Act of Congress designating June 14 of each year as National Flag Day. From the July 2018 issue of The Bright Side, Cobb County Georgia’s Newspaper covering Smyrna, Vinings, Mableton, Powder Springs and Austell, GA.
WellStar Cobb Hospital, one of the premier healthcare providers offering top quality, community-based professional healthcare services to the residents of Austell and South Cobb communities, marked the 50th Anniversary of its opening on June 3. What began as a 50-acre peach orchard is now a nationally recognized campus for hope and healing with 382 licensed beds and 2,200 staff members who care for more than 104,000 patients annually. From the first patient treated 50 years ago, to the millions seeking care and comfort since, WellStar Cobb Hospital continues to fulfill its founding vision of being there for patients every minute of every hour of every day. No history of WellStar Cobb Hospital would be complete without recognizing the tireless dedication and support of Charles “Pete” Wood. From his participation in 1962 as founding Trustee of the Hospital Authority of Cobb County, to his leadership as Chairman of the WellStar Board of Trustees, Wood gave freely of his talents and time to ensure quality healthcare for Cobb County residents. WellStar Cobb Hospital’s Therapeutic Horticulture Garden – completed in 1993 for recovering patients and their families – was dedicated and renamed the Charles “Pete” Wood Garden in 2000 to honor him for his many decades of service. The 50-year history of the hospital is filled with many milestones, most notably its merger with Kennestone, Douglas, Paulding and Windy Hill hospitals in 1993 to form a robust health system, Northwest Georgia Health System, Inc. On March 6, 1998, the name WellStar was introduced as the umbrella for these community hospitals. The words “Well” represent the mission of providing for the health of the community, and “Star” represents leadership, innovation and commitment to excellence. Dedicated physicians work hand-in-hand with nurses and others to bring the best in modern medicine at WellStar Cobb Hospital. The hospital offers several exemplary programs, including a recently renovated burn and wound unit, a state-of-the-art cardiac program and women’s center and a leading cancer program that will have a new facility unveiled in late 2018. If you ever have to dial 911, what do you expect to be the outcome? Professionals with the highest level of expertise and professionalism to respond. The Smyrna Public Safety Foundation (SPSF) is dedicated to support the professional endeavors of the public safety agencies within Smyrna and is dedicated to improving the quality of life for those who live or work in the City of Smyrna and surrounding communities. 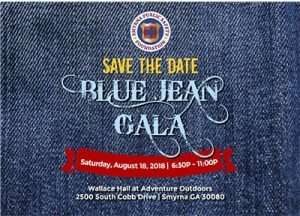 The 2018 Blue Jean Gala is Aug. 18 in Wallace Hall at Adventure Outdoors, 2500 South Cobb Drive, Smyrna. The title sponsor is The Charyn Darby Foundation. This event is different from others in the community because it allows attendees to spend the evening with our local heroes and all funds raised stay here in the Smyrna community to promote and support the many important initiatives of the Smyrna Fire and Police Departments. Annually, the SPSF sponsors the Smyrna Public Safety Awards and Recognition banquet where these Heroes are recognized for their exemplary service to the community. In December, the SPSF teams up with the Smyrna elementary schools and takes youth on a shopping spree for the Shop with a Hero event. Make plans now to attend the Annual Blue Jean Gala. Ticket price includes live entertainment, dinner and beverages. There will be numerous unique raffle items as well as silent auction items, many which are experiences involving public safety. At this event you are encouraged to dress casual (jeans and your favorite accessories are totally acceptable). There will be a photo booth available where you can memorialize the event. For more information and purchase tickets, visit the website at www.smyrnapsf.org, send an email to admin@smyrnapsf.org, or call 404-791-6935. Cobb Commissioners have agreed on a compromise name, “Mableton’s Chattahoochee River Line Park,” for a new 103-acre park along the Chattahoochee River. Parks Director Jimmy Gisi says the members of the Mableton Improvement Coalition and the River Line Historic Area, Inc. came up with the new name and ran it by District Commissioner Lisa Cupid who approved of it. The property runs for one mile along the river and includes a variety of well-preserved Civil War-era earthworks. A large part of the property is on the National Register of Historic Places. Cobb County has owned the property since 1990 when it acquired it through the settlement of litigation. The work on the park will cost approximately $1 million. Funding will come from the 2016 Special Purpose Local Option Sales Tax (SPLOST) as part of the P.A.R.K.S. program approved by voters. Gisi told commissioners the improvements include a small parking lot, restrooms, signs and historical markers. A small display will show what a confederate Shoupade looked like. Another trail will lead to the remnants of a federal Redan.